There was a time when I thought that Valentine's Day was just for lovers, for the young, for those who were married. Now I look at Valentine's Day as a reminder that we should love each and every day fully. I have lost a lot of people in my life. My two best friends from college, and my best friend in California, among others. So today I will use this day to remind myself to embrace each day and to love the life that I have. Tonight my grandchildren will be calling to talk to me. What greater Valentine gift can there be. Happy Valentine's Day sweet friends. 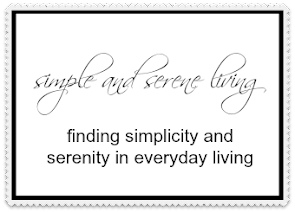 May today and every day be filled with simple and serene love. enjoy all the love around you. Have a wonderful Valentine's Day, Laura. I know what a treat it is to talk with the grandchildren. I can't think of a better treat. Happy Valentine's Day to you, too. Very well said, Laura. Yes, Valentines Day is for everyone who knows to enjoy the love around the World. I hope you have a wonderful day, Pam. Happy Valentine's Day to you too, Diana. I look at it as a day of love for my family, friends and myself! I appreciate all that life has to offer and don't want to take it for granted! SO true, LInda. Everyday is so important. A great quote by Ms. Streep. Love really is the reason for the day. It is Michelle and there are so many people to love. This is such a beautiful and true post. :) Happy Valentine's Day to you! Happy Valentine's Day to you too, Marie. She really is awesome, Holly. Hope you have had a wonderful day. I think Valentines Day is a way to tell people you love that you love them. It doesn't have to be just for couples. I hope that you had a nice one yesterday.